In the year of the band’s historic fiftieth anniversary a Fairport Convention box set, joining the long list of other compilations, box sets and reissued material from the Fairport family in recent years, is perhaps not entirely unexpected. Titled Come All Ye: The First Ten Years this seven-disc anthology collects material from across the changing line-ups and evolving musical styles that characterised the band’s first decade in existence; from the US west coast-influenced beginnings in the late 1960s to exploring and ultimately defining English folk rock, with several journeys into diverse musical territories along the way. What this box set does not do is deliver a full repackage and reissue of all of the albums from this period. Rather, while it does include a selection of songs from across the band’s first 13 studio albums (from 1967’s Fairport Convention through to 1978’s Tipplers Tales) the meat of the anthology is the myriad of out-takes, alternative versions, B-sides, sessions and live recordings. 55 of the 121 tracks are previously unreleased, albeit that most of the songs will be familiar to Fairport fans even if the exact recordings are not. The first two discs span the period of the band’s first four studio albums. Not withstanding that at least a couple of these rank amongst some of the greatest albums ever recorded, the avid Fairport Convention collector could be forgiven for thinking that they are not getting a huge amount of new material here. While there are some real gems, some of the tracks are BBC sessions that differ little from the album versions, and even where they do, a significant number of the less familiar versions of songs have previously been released elsewhere, such as the 2010 Sandy Denny box set or as bonus tracks on album re-issues. Some of the most interesting and unexpected moments come in the later discs. Disc Three includes some alternative versions of songs from the Babbacombe Lee album. Performed live for a BBC TV documentary ’The Man They Could Not Hang’ on the life of John ’Babbacombe’ Lee, they have a much looser feel than the original versions and also include a song written especially for the programme: Farewell To A Poor Man’s Son. Disc Four holds some of the biggest surprises. It includes a number of hitherto unheard tracks from an abortive album from the time when Dave Pegg and Dave Swarbrick invited Canadian singer-songwriter David Rea into the band. The result is a laid-back kind of Americana rather than English folk rock. Indeed, few would ever guess that a track like Maverick Child could be Fairport Convention until, that is, the unmistakable sound of Swarb’s fiddle cuts in about two thirds of the way through. Nevertheless, it provides a fascinating insight into a short-lived and little-known line-up. Disc Five includes Sandy Denny’s previously unreleased original demo of After Halloween from the Rising For The Moon album. It was recorded at her home in Byfield during her second stint with the band and captures her voice beautifully. This disc also gathers together some previously unreleased live recordings from 1976 after Denny had left the band for the second time and Simon Nicol had rejoined. The final two discs are devoted to two full concert recordings. The first of these, with the line-up that recorded the Nine album performing at Croydon’s Fairfield Hall in 1973, has lain unreleased for over four decades and shows the band in cracking form with some excellent guitar from Jerry Donahue. The second heralds Sandy Denny’s return to the band with a performance from the LA Troubadour in 1974. Although, unlike the previous disc, most of this material has been previously available, it is a superb concert that notably captures the band performing some of Denny’s solo material as well as a version of Richard Thompson’s post-Fairport Convention song Down Where The Drunkards Roll. Although there is some repetition with other anthologies, overall Come All Ye: The First Ten Years has plenty to offer the dedicated Fairport fan and includes some thrilling material that has not been released before. However, for the less committed it should be seen as something to complement the purchase of the classic early albums, not to act as a substitute for them. No-one is advised to even contemplate buying this box set, therefore, until they have at least picked up the What We Did On Our Holidays, Unhalfbricking, Liege & Lief and Full House albums and enjoyed the full magic of them in the way they were originally conceived. Folk-rock pioneers Fairport Convention have never been a band to shy away from celebrating their own legacy. When they decided to split in 1979 they held a big outdoor farewell gig in Cropredy, Oxfordshire that proved so successful they decided to stage it again each year, evolving into the big three-day festival we know today. Thirtieth, fortieth and forty-fifth anniversaries of the band have all been celebrated with emotional reunions of surviving ex-members and a similarly nostalgic trip down memory lane is scheduled for Cropredy this August. An anniversary concert in north London, not far from where the band performed their first ever gig fifty years ago to the day, drips with symbolism. However, unlike the lavish reunions of the past, tonight was scheduled to be a fairly ordinary gig half-way through the band’s spring tour, albeit one that coincided with an extraordinary anniversary. For a band that has done more anniversary performances than many acts have done albums I was beginning to wonder what, if anything, would make tonight’s gig that bit more special than many of the other admittedly excellent performances I’d seen from this band. The answer lay in the rapturous and sustained applause the band receive as they walk on stage tonight, even before they play a single note. The spontaneous wave of love and and affection is palpable and tonight was clearly going to be as much about the audience as about the band. Performing a mixture of songs from their new album 50:50@50 and older staples, original member Simon Nicol (joined 1967) together with “newbies” Dave Pegg (joined 1969), Ric Sanders (joined 1985), Chris Leslie (joined 1996) and Gerry Conway (joined 1998) provide a nice overview of different eras of the band. From the late 60s classic Sandy Denny/Richard Thompson era the unforgettable ‘Who Knows Where The Time Goes’ is an obvious highlight. While from the mid 80s, when Fairport became a working, touring band again, Ralph McTell’s ‘Hiring Fair’ is another genuine highlight of tonight’s set. A couple of “surprise” moments are when Pentangle’s Jacqui McShee joins the band on stage to sing ‘The Lady of Carlisle’ the track for which she provides guest vocals on the current album; and when Sally Barker (who reprised a number of Sandy Denny songs when she toured with the surviving members of Denny’s post-Fairport outfit Fotheringay a couple of years ago) lovingly recreates the magic of Denny’s ‘Rising For The Moon’. ‘Matty Groves’ and ‘Meet On The Ledge’ are two songs the band could never get away without performing and for many years now have been the traditional climax to any Fairport gig. After an energetic ‘Matty Groves’ the band are serenaded with a spontaneous audience rendition of ‘Happy Birthday’ when they come back on for an encore. As tonight seemed as much about celebrating the longevity of the Fairport audience as celebrating the longevity of the band, this seems an especially nice touch and makes the ensuing sing-along to ‘Meet On The Ledge’ all the more poignant. Happy 50th Fairport! In the late ‘60s Fairport pretty much invented English folk-rock and since the late ‘70s the band’s Cropredy festival has been an annual fixture for anyone with a love of this type of music. While the festival as a whole tends to offer an eclectic mixture of folk and heritage rock acts, Fairport Convention themselves always headline on the Saturday night. While previous years have offered a marathon three-hour session from Fairport, tonight we have a slightly truncated two-hour set. But we are still given a great selection of songs and tunes in that time. The band are about to release a new studio album so brand new material is introduced alongside old favourites. The first of the new songs is Myths and Heroes. F or anyone concerned that the “rock” element of Fairport’s genetic composition has been downplayed in recent years, they will not be at all disappointed with this, a ferocious and brilliantly played slice of folk-rock. For me the two strongest tracks on their last studio album of new material, Festival Bell, are undoubtedly Around the Wild Cape Horn and Mercy Bay. I was delighted to see that these two have remained in the set. Both magnificently sung by Simon Nicol, they are now bona fide Fairport classics that comfortably sit alongside older Fairport classics. We do hear plenty of the older classics, too, however. Walk awhile, Crazy Man Michael, Now Be Thankful and Farewell Farewell are all in there, alongside a great version of The Lark in the Morning medley, which set the template for fast and furious electric folk instrumentals on the genre-defining Liege and Lief album back in 1969. The only thing that really didn’t work for me tonight was the guest spot from vocalist Sally Barker, who sang Sandy Denny’s Who Knows Where the Time Goes. Barker is a star of TV’s The Voice, and while her heavily-pronounced, overly-dramatic vocal delivery may be just what is needed for TV talent shows, it was the exact opposite of the calm, understated, crystal-clear beauty of Sandy Denny’s original. Traditional show closer Meet on the Ledge, written by the band’s original lead guitarist, Richard Thompson at the crazily young age of 17, always provides the collected Cropredy masses with a rousing and emotional final sing-along. 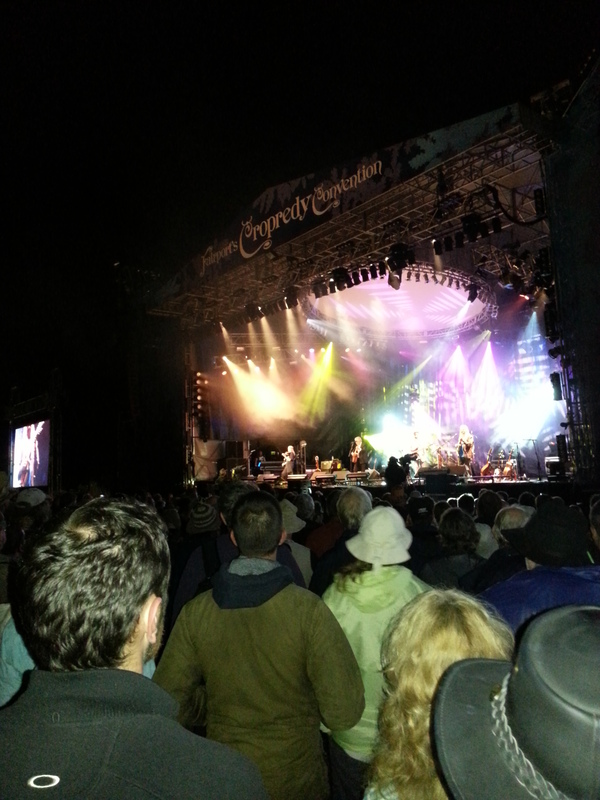 But another defining moment of every Cropredy festival is the penultimate number, Matty Groves. The exact origins of the song (an adulterous tale of a Lady and a servant who both meet a tragic end at the hands of her jealous husband) are lost in the mists of time. But whoever originally wrote it must surely never have imagined that several hundred years after it was written, 20,000 people would stand together in a field in Oxfordshire every year and sing along to all nineteen verses at the top of their voices. We wouldn’t have it any other way. “Don’t worry, if you are not enjoying it and can’t wait for me to finish – I’m only on for twenty minutes.” So explained support act Edwina Hayes. The singer-songwriter turned out to be very much more than bearable and was later welcomed back on to the stage by Fairport Convention towards the end of the night to join them in a performance of the Sandy Denny-era classic “Who Knows Where the Time Goes.” I’ve seen Fairport fifteen times now. Although they have always been adamant that they could not and should not attempt to replace the late Sandy Denny; for me, what turns a good Fairport performance into something very special indeed is when they are able to enlist the assistance of a talented female guest vocalist to sing one or two of Sandy’s songs. This wasn’t the only noteworthy thing about the performance, tonight either. The setlist, which has possibly been getting a bit samey these past few years, has been spruced up for this tour with some new songs as well as some old favourites that had not been heard for a while being brought back. Also notable, on this tour has been the addition of a stand-in bass player. Dave Pegg, who has played with the band since 1970, managed to damage the tendons in his hand and has been unable to play. Although he came on stage to introduce the band and hung around for some occasional backing vocals and on-stage banter, it was his son Matt Pegg on the bass. An excellent replacement who was warmly applauded.